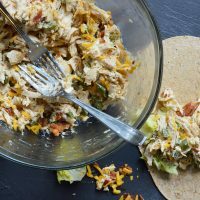 This Jalapeño Popper Chicken Salad is the ultimate! Creamy chicken salad with roasted jalapeños, bacon and cheddar cheese. 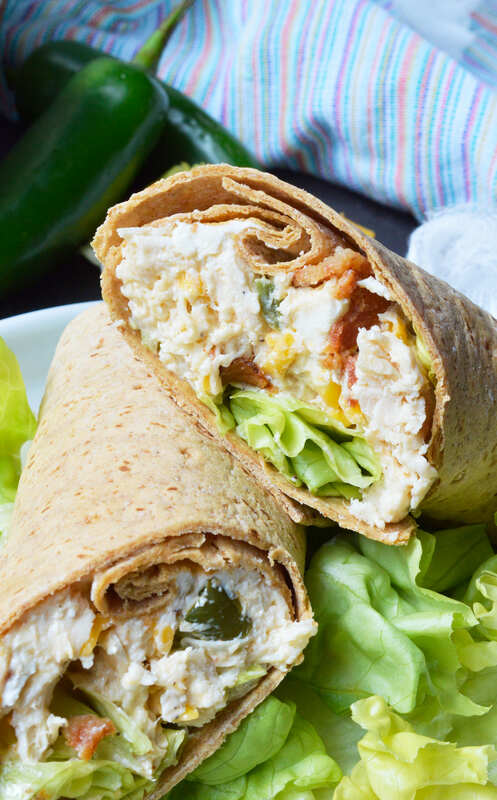 Say goodbye to boring ol’ chicken sandwiches and have Jalapeño Popper Chicken Wraps instead. I am proud to be partnering with Flatout Flatbreads® to bring you this tasty recipe! You just can’t go wrong with jalapeño popper inspired recipes. And what better way to liven up chicken salad than to add some roasted jalapeños, bacon and cheese!?!? Roasting the jalapeños ensures that it is not over-the-top spicy. 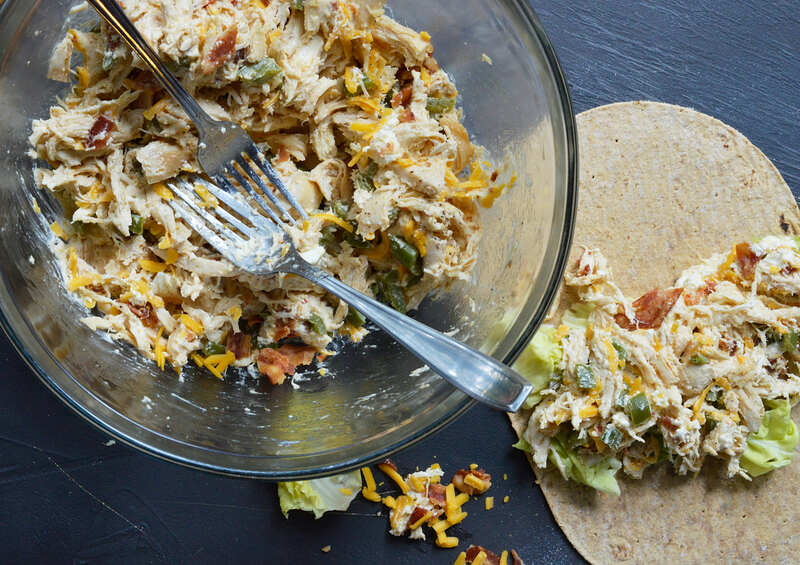 The crisp, salty bacon and cheddar cheese take this chicken salad to the next level! This is a must try, especially for anyone looking for a pop of flavor in their lunches. Since the chicken salad is a bit heavier it pairs perfectly with Flatout Flatbreads. 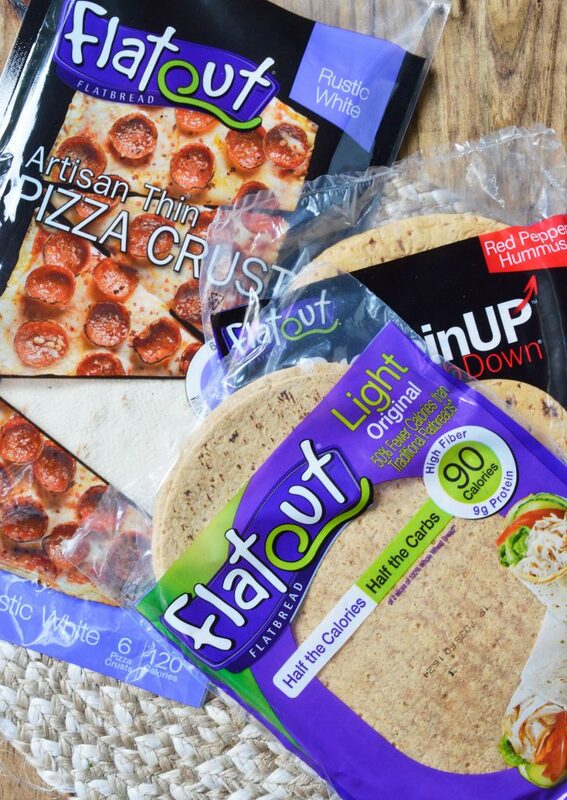 Flatout Flatbreads are BIG on flavor with no added sugar. They are also a great source of protein and fiber. Flatout Flatbread® is now endorsed by Weight Watchers®. Members can enjoy Flatout Flatbreads for 2 to 4 Smart Points® each. Flatout Flatbreads are terrific for portion control, lightening up meals or feeding the family. My daughter and I are in love with the Flatout Artisan Thin Pizza Crust. I’ve been making her favorite Pepperoni and Olive Flatbread Pizza on the regular! 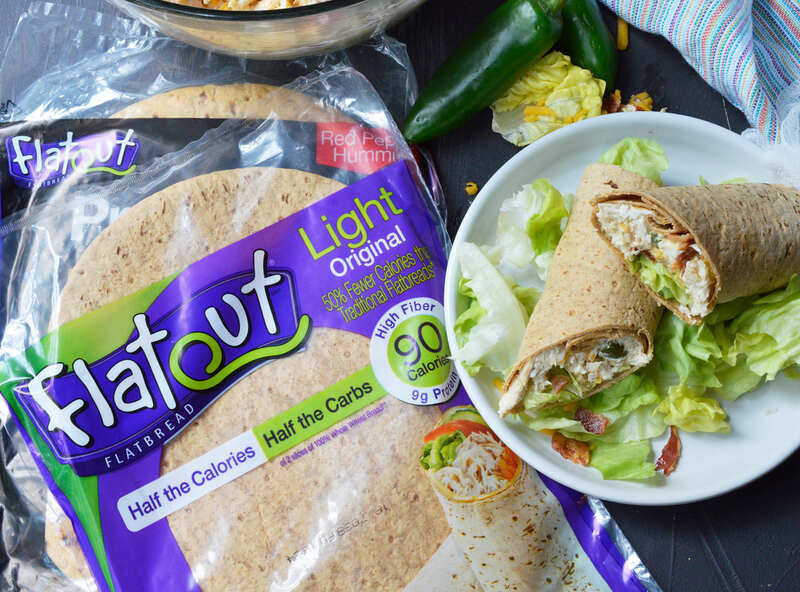 For these wraps I used the Flatout Flatbread® Light Original, added a bit of lettuce then MUNCHED! This is a very filling meal so you can totally be satisfied with half a wrap, or cut them into fun pinwheels. If this is making you hungry you might also like my Bacon Avocado Chicken Salad or Cranberry Almond Chicken Salad. There you have it. The fabulous flavors of jalapeño poppers without the headache. Seriously, jalapeño poppers are a huge pain to prepare. And you get to enjoy it this way for lunch or dinner. Flatout Flatbreads can be found in the deli/bakery section of most grocery store. Or check the FlatoutFinder.com to locate a store near you. 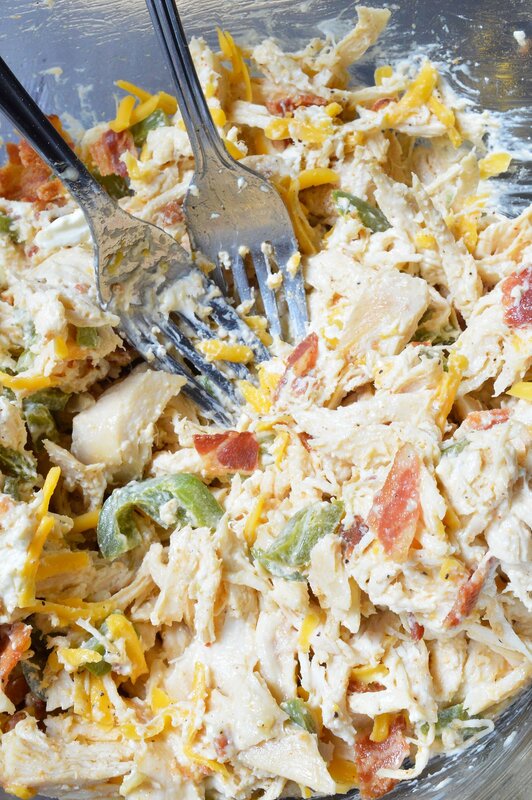 This Jalapeño Popper Chicken Salad is the ultimate! Creamy chicken salad with roasted jalapeños, bacon and cheddar cheese. Say goodbye to boring ol' chicken sandwiches and have Jalapeño Popper Chicken Wraps instead. Place chicken in large baking dish. Coat with olive oil, salt/pepper, garlic powder, onion powder, paprika and cumin. Cover baking dish with foil. Place jalapeños in a separate smaller baking dish. Coat with olive oil, salt and pepper. Cover baking dish with foil. Bake chicken and jalapeños at the same time. Remove jalapeños after 30 minutes. Let cool then chop. Continue to cook chicken until it reaches an internal temp of 165°F (typically 45-60 minutes total, depending on size and thickness) Remove chicken from oven and let cool. Transfer chicken to large bowl and shred with two forks. Add chopped jalapeños, cream cheese, mayonnaise, and bacon. Stir until combined. Salt and pepper to taste then gently stir in shredded cheddar. Serve in wraps, sandwiches, on top of salad, crackers or alone. I love a good chicken salad and I also love Flatout! This sounds like it’ll be lunch this week! This is my kind of chicken salad! I definitely need to try this. Well this is a chicken salad I can get behind!! What a fun chicken salad. Beautiful wrapped up in Flatout! This looks absolutely amazing. I love jalapeno poppers and chicken so this would be perfect for me. I bet the flavour just pops. Do you have the nutrional values for theJalapeno Popper Chicken Salad? This is so good. I use your cream in place of mayo and add ranch dip mix.